Eguchi, J., Dasgupta, R. (2018) Redox state of the convective mantle from CO2-trace element systematics of oceanic basalts. Geochem. Persp. Let. 8, 17–21. NSF grants EAR-1255391, OCE-1338842, and the Sloan Foundation through Deep Carbon Observatory. Frost, D.J., McCammon, C.A. (2008) The Redox State of Earth’s Mantle. Annual Review of Earth and Planetary Sciences 36, 389–420. ). On the other hand, the depth-fO2 profile of the convecting mantle remains poorly known. We compare the CO2­-Ba and CO2-Nb systematics of natural oceanic basalts to the CO2-trace element concentrations that can be generated via contributions from depleted peridotite partial melts and graphite-saturated partial melts of subducted lithologies. Results suggest that to produce the CO2 enrichments relative to the depleted end member observed in natural oceanic basalts, subducted lithologies cannot be graphite-saturated at the onset of melting or must undergo oxidative transformation below the respective volatile-free solidi. Therefore, the oxygen fugacity profile of the continental lithospheric mantle may not be applicable to the deep convecting upper mantle, with the convecting upper mantle to at least 150 km depth being more oxidised than the carbonate vs. graphite/diamond buffer. Figure 1 Pressure-temperature conditions for generation of partial melts from crustal/mafic lithologies in the mantle with colour map for wt. % SiO2 in the melt. Also plotted for reference are mantle adiabats for mantle potential temperatures of 1350 and 1650 °C (dashed lines), solidi of various volatile-free lithologies (1-metapelite, 2-MORB-eclogite, 3-silica-deficient garnet pyroxenite, 4-peridotite, references given in footnote of Table S-3 – the table of compiled experiments), and graphite-diamond transition (dotted line). Figure 2 CO2 concentrations calculated at the CCO buffer for each experiment in Figure 1. Vertical blue lines are highest CO2 concentrations measured in natural oceanic basalts from different locations (Table S-2) that are thought to receive contributions from subducted lithologies. Red band is for CO2 contents expected in depleted peridotite-derived partial melts based on undegassed melt inclusions from Siqueiros (Saal et al., 2002) and calculations using an experimental bulk partition coefficient for CO2 and source CO2 estimate of ~75 ppm at F = 10 % (Rosenthal et al., 2015). Figure 3 CO2-Nb and CO2-Ba mixing lines between depleted peridotite melts and graphite-saturated melts of subducted lithologies. Mixing lines are calculated at different logfO2s relative to FMQ up to the CCO buffer as denoted by numbers above mixing line (the average fO2 of eclogites based on CLM xenoliths at this pressure is marked with bold text). Each marker along a mixing line represents 10 wt. % incremental contribution from subducted lithology partial melt. Data points are the CO2-Nb/CO2-Ba concentrations recorded in the least degassed natural basalts at each location. Data point and mixings lines coloured for melt SiO2 (wt. %) contents. Pink shaded region shows CO2-Nb-Ba contents at graphite-saturation from CCO to FMQ-2.5 for all relevant experimental partial melts for a particular lithology from Figure 1. 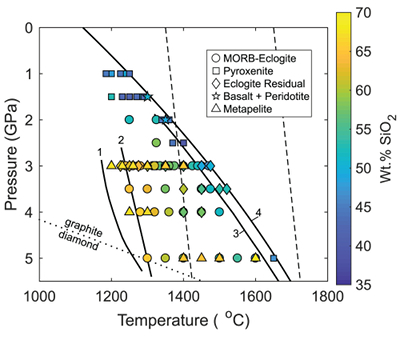 Gray band shows CO2-Nb-Ba calculations for a depleted peridotite from 1-10 % melting degree (see also Fig. S-1). Data for generation of Figure 3 given in Supplementary Information. Figure 4 Pressure vs. fO2 computed for continental lithospheric mantle xenoliths versus those that have been estimated here for oceanic mantle sources (gray region). DCDG/D is the graphite/diamond transition in eclogite/pyroxenite (Luth, 1993). Graphite/diamond transition in peridotite is shown for reference (EMOG/D). References for xenolith data are in Table S-4. Cottrell, E., Kelley, K.A. 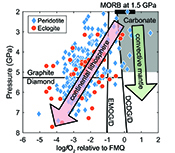 (2011) The oxidation state of Fe in MORB glasses and the oxygen fugacity of the upper mantle. Earth and Planetary Science Letters 305, 270–282. Hartley, M.E., Shorttle, O., Maclennan, J., Moussallam, Y., Edmonds, M. (2017) Olivine-hosted melt inclusions as an archive of redox heterogeneity in magmatic systems. Earth and Planetary Science Letters 479, 192–205. Woodland, A.B., Koch, M. (2003) Variation in oxygen fugacity with depth in the upper mantle beneath the Kaapvaal craton, Southern Africa. Earth and Planetary Science Letters 214, 295–310. Gudmundsson, G., Wood, B.J. (1995) Experimental tests of garnet peridotite oxygen barometry. Contributions to Mineralogy and Petrology 119, 56–67. Yaxley, G.M., Berry, A.J., Rosenthal, A., Woodland, A.B., Paterson, D. (2017) Redox preconditioning deep cratonic lithosphere for kimberlite genesis - Evidence from the central Slave Craton. Scientific Reports 7, doi: 10.1038/s41598-017-00049-3. Dasgupta, R. (2018) Volatile-bearing partial melts beneath oceans and continents–Where, how much, and of what compositions? American Journal of Science 318, 141–165. Brenker, F.E., Vollmer, C., Vincze, L., Vekemans, B., Szymanski, A., Janssens, K., Szaloki, I., Nasdala, L., Joswig, W., Kaminsky, F. (2007) Carbonates from the lower part of transition zone or even the lower mantle. Earth and Planetary Science Letters 260, 1–9. Kiseeva, E.S., Vasiukov, D.M., Wood, B.J., McCammon, C., Stachel, T., Bykov, M., Bykova, E., Chumakov, A., Cerantola, V., Harris, J.W., Dubrovinsky, L. (2018) Oxidized iron in garnets from the mantle transition zone. Nature Geoscience 11, 144–147. Gaillard, F., Scaillet, B., Pichavant, M., Iacono-Marziano, G. (2015) The redox geodynamics linking basalts and their mantle sources through space and time. Chemical Geology 418, 217–233. ). While these natural observations may be due to special circumstances, they raise the possibility that the CLM fO2 profile may not be applicable to the convecting mantle. CO2 Enrichment of Oceanic Basalt – Graphite/Diamond or Carbonate-present Melting? Hofmann, A.W., White, W.M. (1982) Mantle plumes from ancient oceanic crust. Earth and Planetary Science Letters 57, 421–436. Spandler, C., Yaxley, G., Green, D.H., Rosenthal, A. (2008) Phase Relations and Melting of Anhydrous K-bearing Eclogite from 1200 to 1600 C and 3 to 5 GPa. Journal of Petrology 49, 771–795. Aubaud, C., Pineau, F., Hékinian, R., Javoy, M. (2006) Carbon and hydrogen isotope constraints on degassing of CO2 and H2O in submarine lavas from the Pitcairn hotspot (South Pacific). Geophysical Research Letters 33, L02308. Anderson, K.R., Poland, M.P. (2017) Abundant carbon in the mantle beneath Hawai‘i. Nature Geoscience 10, 704–708. Hauri, E.H., Maclennan, J., McKenzie, D., Gronvold, K., Oskarsson, N., Shimizu, N. (2017) CO2 content beneath northern Iceland and the variability of mantle carbon. Geology 46, 55–58. Eguchi, J., Dasgupta, R. (2017) CO2 content of andesitic melts at graphite-saturated upper mantle conditions with implications for redox state of oceanic basalt source regions and remobilization of reduced carbon from subducted eclogite. Contributions to Mineralogy and Petrology 172, 12. Eguchi, J., Dasgupta, R. (2018) A CO2 solubility model for silicate melts from fluid saturation to graphite or diamond saturation. Chemical Geology 487, 23–38. Dasgupta, R., Hirschmann, M.M. (2006) Melting in the Earth’s deep upper mantle caused by carbon dioxide. Nature 440, 659–662. ). Therefore, oceanic basalts receiving contributions from crustal/mafic lithologies will have different CO2 concentrations depending on whether partial melting of these easily fusible lithologies occurred under graphite/diamond-saturated versus carbonated conditions. In the following, we test whether CO2 and other trace element enrichments observed in natural basalts can be produced by graphite-saturated melting of recycled lithologies. If CO2 concentrations of natural samples are too high to be explained by recycled lithology contributions via graphite-saturated melting, it would suggest that the fO2 of the subducted lithologies at or below their nominally volatile-free solidi must be high enough for carbon to exist as carbonate. ). Figure 1 shows compiled experiments in P-T space with colours corresponding to wt. % SiO2 in the melt, which is a major controller of CO2 solubility, with more silica-depleted melts dissolving more CO2. Saal, A.E., Hauri, E.H., Langmuir, C.H., Perfit, M.R. (2002) Vapour undersaturation in primitive mid-ocean-ridge basalt and the volatile content of Earth’s upper mantle. Nature 419, 451–455. Dixon, J.E., Clague, D.A., Wallace, P., Poreda, R. (1997) Volatiles in Alkalic Basalts from the North Arch Volcanic Field, Hawaii: Extensive Degassing of Deep Submarine-erupted Alkalic Series Lavas. Journal of Petrology 38, 911–939. 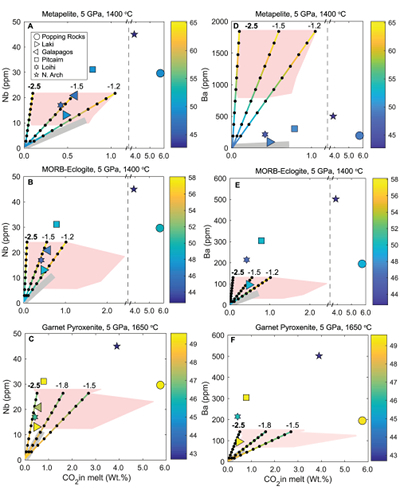 Cartigny, P., Pineau, F., Aubaud, C., Javoy, M. (2008) Towards a consistent mantle carbon flux estimate: Insights from volatile systematics (H2O/Ce, δD, CO2/Nb) in the North Atlantic mantle (14° N and 34° N). Earth and Planetary Science Letters 265, 672–685. ). For locations with lower CO2 concentrations in basalts, such as those from Laki and Loihi, even many of the silica-rich melts may dissolve sufficient CO2 under graphite/diamond-saturated conditions. The question, however, is whether realistic proportions of subducted lithology-derived melt can yield the CO2-trace element systematics of these basalts. Rosenthal, A., Hauri, E.H., Hirschmann, M.M. (2015) Experimental determination of C, F, and H partitioning between mantle minerals and carbonated basalt, CO2/Ba and CO2/Nb systematics of partial melting, and the CO2 contents of basaltic source regions. Earth and Planetary Science Letters 412, 77–87.
) and trace element concentrations using the batch melting equation (more details in Supplementary Information). Data points and mixing lines are coloured for wt. % SiO2 measured in natural basalts and wt. % SiO2 resulting from mixing depleted peridotite partial melt and partial melts of recycled lithologies. Shorttle, O., Maclennan, J., Lambart, S. (2014) Quantifying lithological variability in the mantle. Earth and Planetary Science Letters 395, 24–40. ). Therefore, it is possible that for some CO2-enriched plume-fed basalts, melting of pyroxenites under graphite-saturated conditions can deliver enough CO2 to match the observed enrichment. Dasgupta, R., Hirschmann, M.M., McDonough, W.F., Spiegelman, M., Withers, A.C. (2009) Trace element partitioning between garnet lherzolite and carbonatite at 6.6 and 8.6 GPa with applications to the geochemistry of the mantle and of mantle-derived melts. Chemical Geology 262, 57–77. Matthews, S., Shorttle, O., Rudge, J.F., Maclennan, J. (2017) Constraining mantle carbon: CO2-trace element systematics in basalts and the roles of magma mixing and degassing. Earth and Planetary Science Letters 480, 1–14. ). Rather, we only test whether the least degassed basalt CO2-trace element systematics for a given location can be explained by melt contribution from a graphite-saturated crustal lithology, and the simple mixing model used here is appropriate for that test. In addition to melt-melt mixing, we also test another scenario where the graphite-saturated partial melt of the subducted lithology is reactively frozen in upon interaction with ambient peridotite, and this new fertilised lithology melts at shallower oxidised conditions (see Fig. S-2). We find these calculations do not change the main conclusions, especially when the limit of eclogite melt addition through complete reactive crystallisation is considered. Dasgupta, R., Hirschmann, M.M., Withers, A.C. (2004) Deep global cycling of carbon constrained by the solidus of anhydrous, carbonated eclogite under upper mantle conditions. Earth and Planetary Science Letters 227, 73–85. Shorttle, O., Moussallam, Y., Hartley, M.E., Maclennan, J., Edmonds, M., Murton, B.J. (2015) Fe-XANES analyses of Reykjanes Ridge basalts: Implications for oceanic crust’s role in the solid Earth oxygen cycle. Earth and Planetary Science Letters 427, 272–285. ), lending support for the oxidised nature of source regions for enriched oceanic basalts proposed here. Luth, R.W. (1993) Diamonds, eclogites, and the oxidation state of the Earth’s Mantle. Science 261, 66–68. ), marks the lower fO2 limit (≥FMQ) of mafic/crustal lithologies in the convecting upper mantle up to ~5 GPa. fO2s calculated for CLM peridotite and eclogite xenoliths at similar depths suggest that C will be hosted in graphite/diamond. ). Graphite/diamond transition in peridotite is shown for reference (EMOG/D). References for xenolith data are in Table S-4. The authors thank Dr. Oliver Shorttle and an anonymous reviewer for their thoughtful comments which helped improve the manuscript. The authors also thank Dr. Helen Williams for handling the manuscript. The research received support from NSF grants EAR-1255391, OCE-1338842, EAR-1763226, and the Sloan Foundation through Deep Carbon Observatory. Many of these basalts have elevated CO2 concentrations relative to normal mid-ocean ridge basalts (Aubaud et al., 2006), which may be due to a CO2 contribution from subducted lithologies, which have higher CO2 concentrations relative to primitive mantle (Anderson and Poland, 2017; Hauri et al., 2017). (2) Carbonate inclusions have been found in diamonds from depths in the mantle that should be in the graphite/diamond stability field if the CLM fO2 profile is applied to the convecting upper mantle (Brenker et al., 2007). Figure 2 shows that it is unlikely that a graphite/diamond-saturated melt derived from any recycled lithology can dissolve enough CO2­ to generate the high CO2 concentrations observed at the North Arch of Hawaii and popping rocks from the North Atlantic (Dixon et al., 1997; Cartigny et al., 2008). Current understandings of mantle redox are largely based on measurements of Fe3+ and Fe2+ in mantle-derived basalts, which suggest that the oxygen fugacity of Earth’s shallow mantle to about 1.5 GPa is close to the FMQ buffer (e.g., Cottrell and Kelley, 2011; Hartley et al., 2017). We only consider partial melting studies conducted at pressure-temperature conditions below the peridotite solidus to investigate processes which occur deeper than the onset of peridotite partial melting, as previous studies have already demonstrated that at shallow depths where major peridotite melting occurs, fO2 is around the FMQ buffer (e.g., Cottrell and Kelley, 2011). (1) Kimberlites (oxidised, CO2-rich magmas) are generated deep in the mantle, then migrate through overlying cratons, often picking up diamonds, a reduced form of carbon, implying there are regions in the mantle deeper than CLM depths where diamond resides that are more oxidised (Yaxley et al., 2017; Dasgupta, 2018). On the other hand, carbonate-bearing lithologies melt at the lithology’s carbonated solidus and generate a carbonated melt with up to ~45 wt. % CO2 (e.g., Dasgupta and Hirschmann, 2006). We show that if CO2-trace element enrichment observed in minimally degassed oceanic basalts is due to contribution from recycled crusts, then the onset of melting must occur at carbonate-saturated conditions, which along mantle adiabats occur at pressures >10 GPa (Dasgupta et al., 2004); or oxidative transformation of diamond-bearing lithologies must occur deeper than their respective volatile-free solidus. Basalts at Pitcairn, North Arch of Hawaii, and the popping rocks cannot be explained by mixing with a graphite-saturated partial melt of any lithology, and require mixing with carbonated silicate melts, which have been demonstrated to reproduce CO2-trace element systematics of even the popping rocks (e.g., Dasgupta et al., 2009). Graphite-bearing lithologies melt at the lithology’s nominally volatile-free solidus and generate a silicate melt with fO2-dependent CO2 concentrations (e.g., Eguchi and Dasgupta, 2017, 2018). We use a new, compositionally dependent CO2 solubility model for silicate melts (Eguchi and Dasgupta, 2018) applicable to graphite/diamond-saturated conditions to investigate a wide range of lithologies. The enriched end member melts are generated by calculating graphite-saturated CO2­ concentrations at different fO2s (Eguchi and Dasgupta, 2018) and trace element concentrations using the batch melting equation (more details in Supplementary Information). 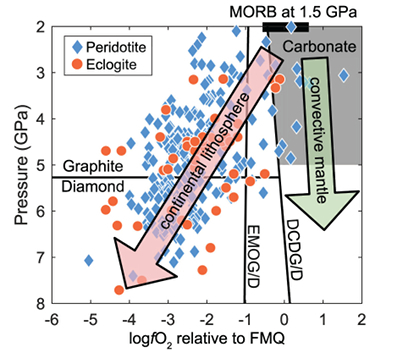 The redox state of mantle lithologies, based on xenoliths from continental lithospheric mantle, has been shown to decrease with depth and reach oxygen fugacities (fO2) at which graphite/diamond will be the stable form of carbon at pressures greater than about 3-4 GPa (e.g., Frost and McCammon, 2008). The oxidation state of the mantle plays a critical role in dictating the geochemical and geodynamic evolution of Earth and its atmosphere (e.g., Frost and McCammon, 2008). The fO2 decrease with increasing depth observed in CLM has been proposed to apply to the convecting mantle (e.g., Frost and McCammon, 2008). (4) Komatiites, which are generated deeper in the mantle than basalts have similar redox states to MORB (Gaillard et al., 2015). This trend has been attributed to the increasing stability of the Fe3+-bearing skiagite component of garnet with increasing depth (Gudmundsson and Wood, 1995). Many oceanic basalts are argued to contain partial melt contributions of subducted lithologies such as sediments, MORB-eclogite, and pyroxenite (Hofmann and White, 1982), which begin to melt deeper than peridotite due to their lower solidi (e.g., Spandler et al., 2008). (3) Kiseeva et al. (2018) argue that fO2 measurements of garnet inclusions in diamonds from the mantle transition zone become more oxidised with depth, and are more oxidised than predicted by the Fe-controlled fO2 profile inferred from CLMs. The DCDD/G buffer, which is the fO2 at which graphite/diamond will coexist with carbonate in eclogite, and may also be applicable to pyroxenite (Luth, 1993), marks the lower fO2 limit (≥FMQ) of mafic/crustal lithologies in the convecting upper mantle up to ~5 GPa. However, if the subducted lithologies and ambient mantle are in redox-equilibrium, then the fO2 of the ambient mantle should also be in the carbonate stability field because the carbonate to graphite/diamond transition occurs at higher fO2s in eclogite/pyroxenite (DCDD/G) compared to mantle peridotite (EMOG/D) (Fig. 4) (Luth, 1993). We acknowledge that the simple binary mixing model presented here is unlikely to represent melt-mixing in nature, however we do not seek to explain the entire array of basalts for a particular location (e.g., Matthews et al., 2017). 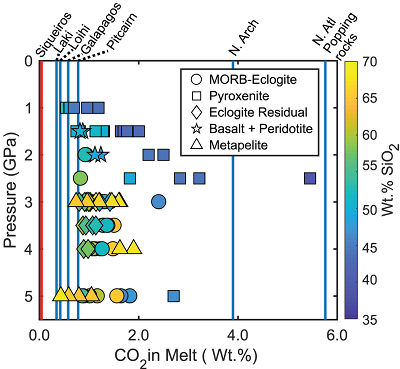 Figure 2 [...] Red band is for CO2 contents expected in depleted peridotite-derived partial melts based on undegassed melt inclusions from Siqueiros (Saal et al., 2002) and calculations using an experimental bulk partition coefficient for CO2 and source CO2 estimate of ~75 ppm at F = 10 % (Rosenthal et al., 2015). In Figure 2 we show CO2 concentrations calculated for experimental partial melts at the CCO buffer (maximum amount of CO2 dissolved with graphite present in the source) compared to the highest CO2 concentrations measured in enriched oceanic basalts from several locations. CO2 concentrations from basalts at Siqueiros are measured in undegassed melt inclusions and may be widely representative of CO2 concentrations for basalts from partial melts of normal primitive mantle (Saal et al., 2002). The required mass fractions of melt derived from a pyroxenitic source would be about 50 % at Laki to 80 % at Loihi, which lie at the extreme upper end for estimates made for plume-fed basalts (Shorttle et al., 2014). In addition, previous studies on Iceland have shown a positive correlation between melt enrichment and oxidation state of erupted basalts (Shorttle et al., 2015), lending support for the oxidised nature of source regions for enriched oceanic basalts proposed here. The fO2 of the deeper portions of Earth’s mantle is chiefly known from mantle xenoliths recovered from continental lithospheric mantle (CLM), which suggest fO2 decreases with increasing depth (e.g., Woodland and Koch, 2003).